MWC 2018 is just a couple of weeks away from now and we are going to witness the launch of new smartphones from different manufacturers including Samsung, Sony and many others. Motorola is also going to announce new smartphones at the event that is scheduled to start from 26 February till March 1st in Barcelona. 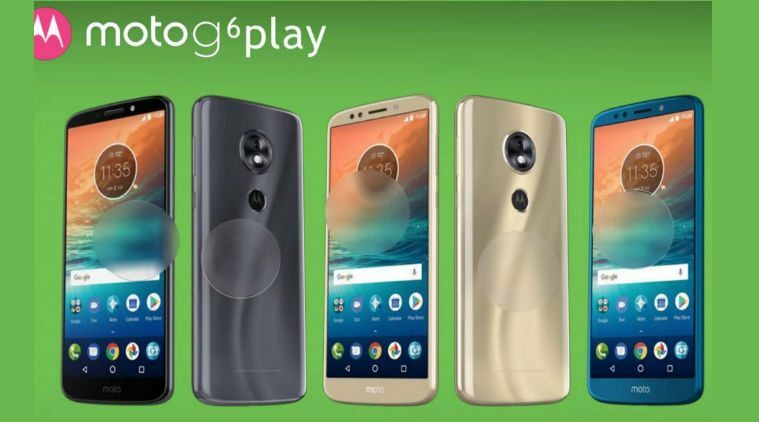 The company is expected to launch a number of new devices including the new Moto G6 series that includes Moto G6, Moto G6 Play and Moto G6 Plus, Moto X5, Moto Z3 and Moto Z3 Play. The Moto G6 Play has just been spotted listed by the Taiwan's NCC department with the model number XT1922-1 that is confirmed to be marketed as Moto G6 Play according to the listing. The XT1922-1 was rumored to be the Moto E5 smartphone but now NCC has cleared everything about this model number. The Moto G6 Play is is listed by NCC but the listing doesn't have any details available about its specifications. The device will also have other model numbers like XT1922-2, XT1922-3, XT1922-4, XT1922-5, XT1922-10 that might be having different RAM, colors and storage options. 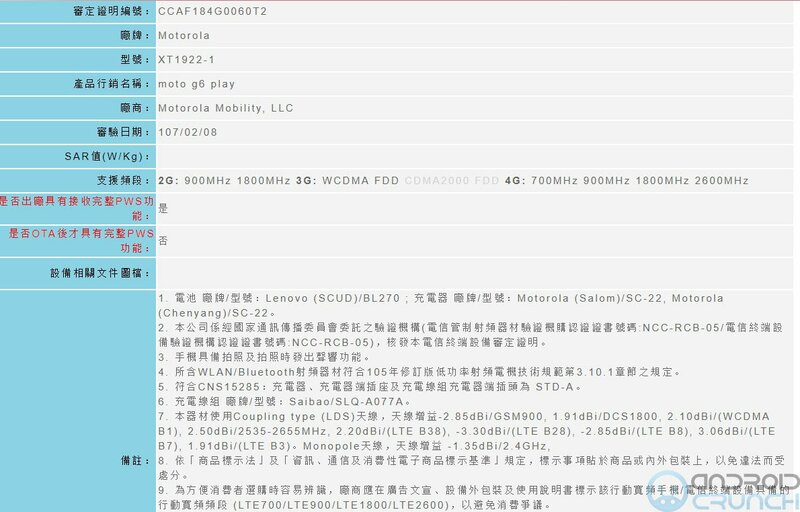 The XT1922-4 variant has already received the FCC approval last month confirming some of the specifications of the device. Moto G6 Play is expected to launch with a 5.7-inch HD display and will have a 4000mAh battery. It will be available with dark charcoal, gold and deep blue colour options as per the rumors. I will have a fingerprint scanner but on the rear side this time that will also have a "M" logo as we saw in its leaked images in the past. The Moto G6 Play will be powered by the Snapdragon processor and will have multiple variants. The Moto G6 will have features like a 5.7-inch Full HD+ display and will be powered by the Snapdragon 450 along with 3GB/4GB RAM coupled with 32GB/64GB internal storage options. It will be backed up by a 3,000mAh battery and will feature a dual rear camera with 12-megapixel+5-megapixel cameras along with a 16-megapixel front camera. The bigger Moto G6 Plus is expected to feature a 5.93-inch Full HD+ display and will be powered by Snapdragon 630 processor. It will have a 3,200mAh battery and it will also have a dual rear camera with 12-megapixel+5-megapixel cameras along with a 16-megapixel front camera. It will be available with Deep Indigo (black), Nimbus (silver), and Dark Lake (dark teal) colour options according to droid-life leak. Stay tuned for more news and updates.